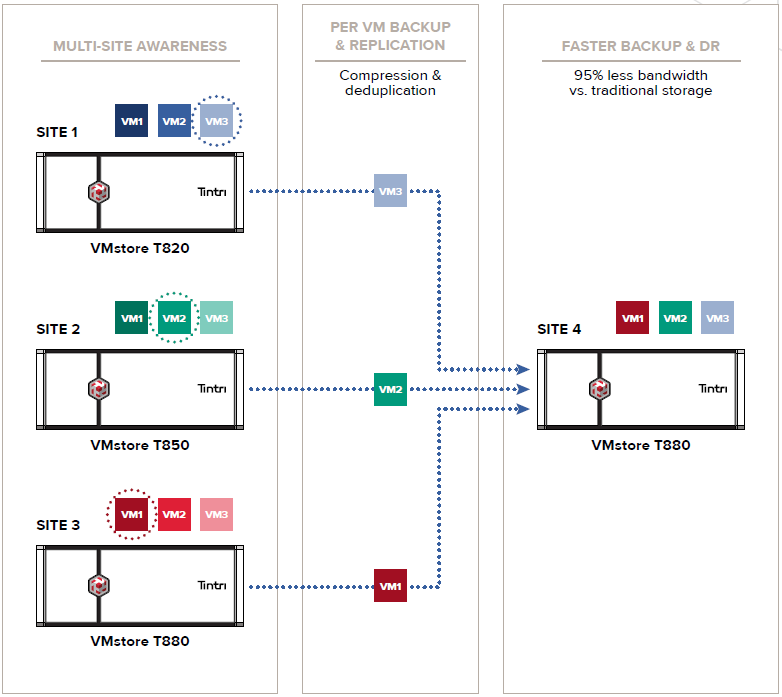 Tintri, smart storage that sees, learns and adapts, manages your storage at the VM level to overcome challenges posed by traditional replication technology with simple high-performance VM-level replication to enable flexible data protection in virtual environments. Tintri ReplicateVM simplifies enterprise data protection and disaster recovery in virtual environments with VM-level customizable policies, integrated deduplication and compression (for reduced WAN bandwidth of up 95 percent), and easy-to-use failover, migration, and testing capabilities. ReplicateVM works with the optional SecureVM software for encryption of data at rest, and supports replication between SecureVM-encrypted VMstores and between encrypted and non-encrypted VMstores for maximum flexibility. 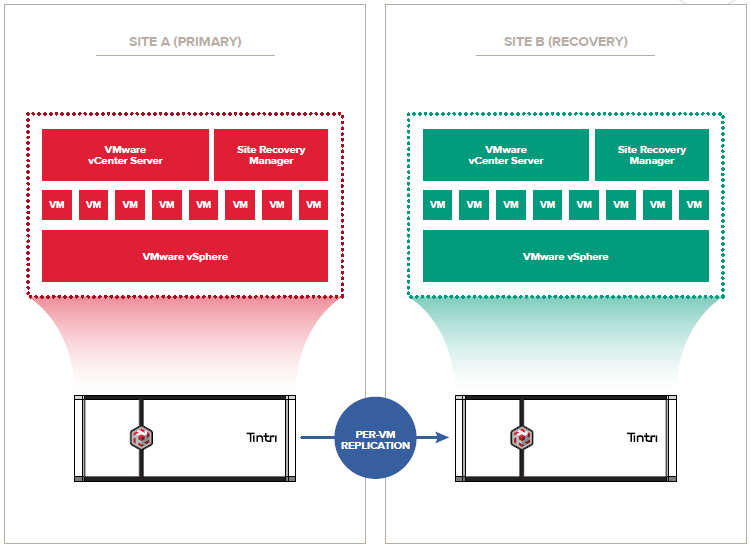 Combine the power of VMware Site Recovery Manager and Tintri ReplicateVM to dramatically simplify your site recovery and data protection. 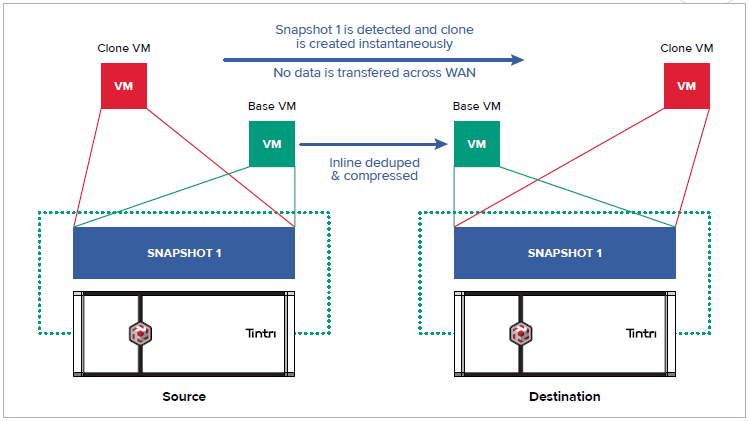 Tintri's per-VM replication makes the storage configuration for SRM easy and significantly reduces the time and WAN bandwidth required for replicating critical applications. The Tintri Storage Replication Adapter (SRA) for VMware Site Recovery Manager is certified and available for all Tintri VMstore customers with ReplicateVM software. More information available on the VMware Compatibility Guide. 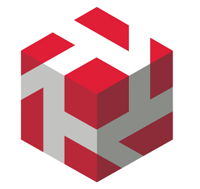 Download the Tintri ReplicateVM Datasheet (PDF).